Many of us have had warts at some time during our lives. Warts like to strike on our fingers, the bottoms of our feet, and sometimes in more unpleasant places. The most common types of warts are plantar warts, which generally target the feet and the hands. Many people rush to the pharmacy when they get warts to find some lotions or creams to get rid of them. While these products are undoubtedly effective, they carry with them the risk of not just killing the wart but all the skin in the surrounding area. The compounds used in these products are quite abrasive to the skin. 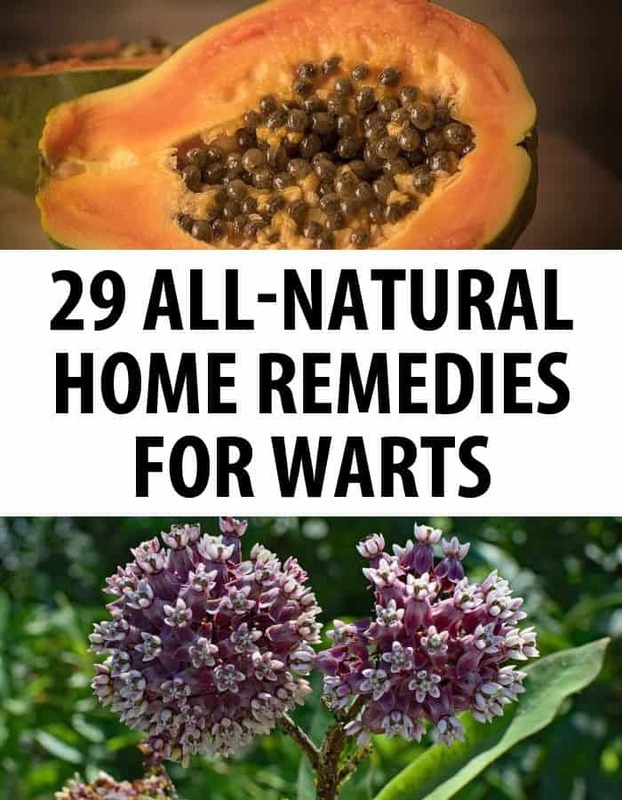 Before you try that, you might want to look you might want to try out some of these natural remedies for healing warts. These remedies will not only help your skin heal, but they will protect you from any of the dangerous effects that you might experience from using pharmaceutical wart removal products. Make sure that you use a pumice stone or a file to scrape off the top layer of skin on your wart. The wart lives beneath the surface, and if you don’t do this first then your treatment will take much longer to work. Potatoes are one of the most simple and effective home remedies for warts, and they can be purchased almost everywhere. For the best results, you will probably want to use and natural, organic potato from a health food store or from the organic section at your local grocery store. All you need to do is cut a potato and a half, or cut it up into small slices. Rub the exposed side of the potato skin on to your wart, and make sure that your skin actually absorb some of the raw potato juice. Do this twice a day for a couple of weeks, and he will probably experience your warts decreasing in size. Apple cider vinegar is one of the most reliable and effective ways to help people get rid of warts. The easiest way to make use of apple cider vinegar is to apply some to a cotton ball. Apply this directly to the wart and adhere it there with the use of a bandaid or a piece of tape. Change the fixing once every few hours. It should only take a couple of days for results to become apparent. You can find apple cider vinegar in most grocery stores. You will want to get the stuff that includes the mother, the organic compound that is responsible for the fermentation. Duct tape is one of the most reliable folk methods of helping people cure warts. All you need to do is put a little bit of duct tape over the area where the warts are. You should replace the tape every few hours. Doing this for a few days will begin to show you immediate results. First, the skin in the area will begin to turn white. Then, the warts will turn black and fall off. This is because the skin won’t be able to breathe and it will die. You can find duct tape in many different stores, namely hardware stores or the hardware section of your local supermarket. Keep in mind some argue that duct tape may not work, and that it most likely has a placebo effect. If you want to see results very quickly, you can combine the above two methods. Apply a little bit of apple cider vinegar to a cotton ball, and then fix that to your wart with a piece of duct tape. The apple cider vinegar will act as a disinfectant and help you kill the wart on its own. The duct tape will starve the area of oxygen, which will further help to eliminate the wart. Try not to cover too much skin with duct tape or you will end up with extra dead skin. This might not cause any serious problems but some people find it to be unsightly. Echinacea isn’t something that’s often associated with removing warts, but it can be very useful in treating them over the long-term. This is because echinacea is one of the most powerful herbs for helping enhance the immune system. Since warts are actually a virus, it makes sense that many people experience breakouts when they are sick or exhausted. This is because there is not enough energy in the immune system for it to target the warts because it’s dealing with other, more serious issues. 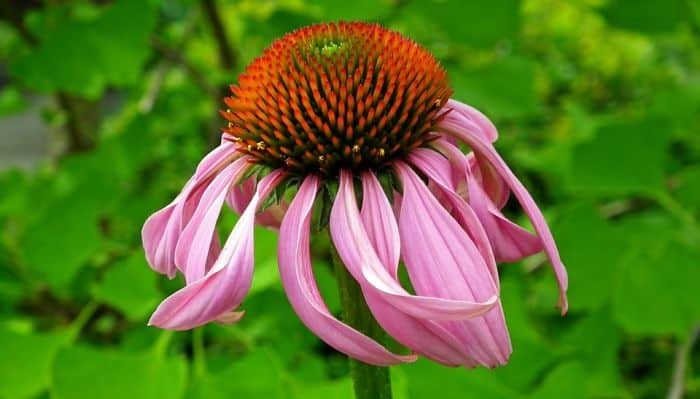 Echinacea can be found in grocery stores and health food stores. There are many brands that make prepackaged echinacea tea bags and you can also find the loose stuff in the bulk aisle at some health food stores. Pineapple can be useful for treating warts in several ways. You can apply fresh pineapple right to your wart and some of the natural acidity of the fruit, as well as some of the nutritive enzymes, will help to kill the wart. Pineapple is also rich in vitamins and minerals like vitamin C which can help to give your immune system a boost. You might not initially think that including pineapple in your diet will help you prevent warts, but they can if they’re a part of a regular, healthy diet. Olive leaf, and olive leaf extracts, have been used for many years in folk medicine because of its powerful ability to help enhance the immune system. In the same way that echinacea can be useful for helping to prevent a breakout of warts, olive leaf extracts can be as well. Look at your nearest health food or supplement store to see if you can find any olive leaf extracts. If you live in the Mediterranean or somewhere that olives grow naturally you can probably just pick your own leaves and drink them as tea or make a poultice out of them by mashing them up. Garlic is known to be one of the best foods for helping to fight off viruses and infections. It has been known to stop illnesses like the common cold and bronchitis and can even be useful for fighting off the flu. Garlic can be immensely useful when taken internally or topically. Internally, it will help your immune system kick out any viruses or infections. Topically, you can mix some garlic into water or oil and apply it to your wart. You can also apply a piece of garlic directly to your wart and fasten it there with tape. However, if the garlic is strong or organic, this might burn your skin (although it will be highly effective). Try to get healthy, organic garlic from a natural food store. Orange peels are another way that you can get rid of oranges naturally and relatively quickly. You can simply save the peels from any oranges that you eat and rub them directly on to your wart. If you do this several times a day for a couple weeks then the orange peels and the nutrients inside will soak into your skin, turning it orange. After that, the wart should turn black and fall off. Furthermore, if you’re eating lots of oranges in an effort to get the peels, then you’ll be able to get a lot of vitamin C into your body. Vitamin C is one of the most important nutrients for ensuring a healthy immune system and this will help make sure that you can fight off any further outbreaks. Nail polish might not be entirely natural, but it’s certainly a viable home remedy that many people have kicking around the house. You can simply apply the nail polish directly to the wart and let it sit for a day or two. Make sure you freshen up the nail polish after that. This is a testament to the nature of the chemicals in nail polish. The good thing about this particular treatment, however, is that you can easily apply the nail polish to only a small area and avoid touching any other part of the skin besides the wart. This will prevent you from damaging healthy skin. Another great way to help yourself get rid of warts is to use aloe vera. Aloe vera has become a popular treatment for all sorts of ailments, from burns to infected cuts to – you got it – warts! You can simply soak a cotton ball in aloe vera and put this on to your wart. You’ll want to make sure that you do this a couple times a day to ensure maximum contact with the aloe vera. Aloe can be purchased in many places, like pharmacies, grocery stores, and natural health food store. Naturally sourced, organic aloe vera will provide you with more health benefits than any other kind. If you really want to do a number on your wart, you can try the deadly combination of nail polish and duct tape. This is a treatment best reserved for the more stubborn warts that just don’t seem to want to go away. The treatment is simple – just apply some nail polish to the wart and wait for it to settle. Then, apply a piece of duct tape overtop of the nail polish. This will ensure that the compounds in the nail polish are attacking the wart and that the virus won’t be able to breathe. This will probably get rid of any warts, even big ones, in no time. This is a folk remedy that might sound kind of weird, but that has been proven to be effective time and time again. Just apply a part of the inside of a banana peel (with the white stuff on it) directly to your wart. You’ll need to make sure that the banana peel stays in direct contact with the wart, and the best way to do this is to tape it on. You can use a small section of banana peel and a slightly bigger piece of duct tape to adhere it to your feet. You’ll probably see results in a few days with this technique. Dandelion milk can be purchased from many natural food stores, but it can also be harvested on your own during the summer months. Just pick some dandelions and make a small cut in the stems. White goop will leak out – this is the good stuff that can be useful for killing warts in addition to improving other areas of your health. You can apply the dandelion milk right to the wart. Dandelion milk tends to dry up quite quickly, so there’s no need to use any adhesives or anything to make sure that it sticks, though you might still want to use a band-aid to prevent the virus from being able to breathe. Castor oil is another impressive treatment for warts. All you need to do is rub some of the oil into the wart a couple times a day. There’s no need to use adhesive or anything, though after the oil is absorbed you will probably want to put socks on. Castor oil can be found in pharmacies, at grocery stores, and in natural food and supplement stores. It’s quite cheap and can be used for numerous other applications in regards to health and beauty. Vitamin E is one of the most powerful antioxidant nutrients. It can be useful for fighting warts both internally and externally. Internally, vitamin E supplements can help you keep your immune system functioning so viruses won’t have a chance of surviving in your body. Externally, you can use vitamin E and apply it directly to the wart itself. Vitamin E can be purchased in multiple forms. Vitamin E oil can be bought, which can be easily applied to the skin. Sometimes vitamin E is sold in capsules which contain oil – these can be pricked open or separated and then applied directly to the skin. If you have papaya kicking around, you might want to save a little bit of it – just the fleshy part on the inside of the skin – for something aside from eating. That’s because papaya can actually be useful for helping to get rid of warts. 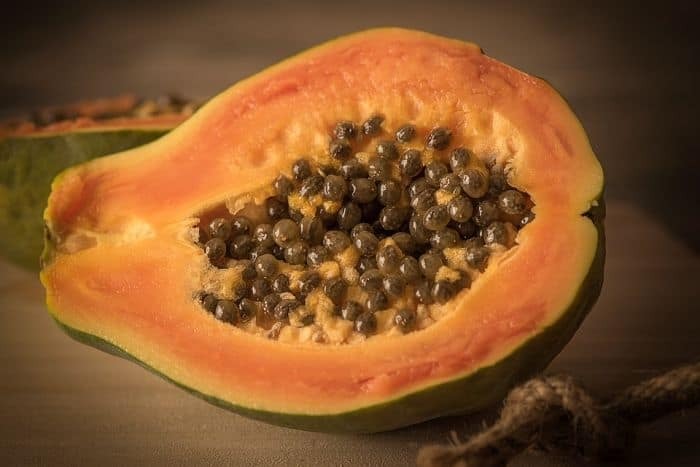 Papaya contains a unique enzyme, papain, which is great for helping to keep the skin healthy. Applying a piece of papaya over a wart can work in much the same way that applying a banana peel can. It will starve the area of oxygen while also revitalizing the skin surrounding the wart. Furthermore, papaya is also full of vitamin A which can help to boost your immune system and prevent warts from breaking out again. Baking powder is another treatment for warts. It can be mixed with water into a sort of paste and then applied to the wart in the evening before you go to bed. Cover the mixture with a band-aid or a sock before going to bed and you’ll probably notice an improvement in a couple days. Another way to make use of the impressive benefits of baking powder is to mix it with castor oil. You can mix the two together to make a paste that’s very easy to use. The castor oil will make it so the baking powder can be absorbed easily into the skin. Applying this mixture to the affected area before going to bed and you’ll notice results in a week or two. Aspirin can be used topically to help kill viruses and other parasites that like to live in the skin. All you have to do is crush up an aspirin tablet and mix it with a bit of water, then apply it directly to the wart. This will effectively kill the virus after doing so for a few weeks. Tea tree oil is one of the best oils for disinfecting the body and fighting off viruses and bacteria. You can apply some tea tree oil to a cotton ball and then swap it directly onto the wart. Doing this will help to ensure that the wart dies off. After a week or two of treating the wart this way, it will turn black and fall off. Make sure that you do this several times a day to ensure that the wart is constantly absorbing tea tree oil. Tea tree oil is becoming increasingly popular and can be found in many places. Products with tea tree oil can be found in cosmetics shops and pharmacies. The oil itself can be found at the pharmacy, the grocery store or a natural health shop. Eucalyptus oil is another potent essential oil that can be useful for helping to fight off infections, warts, and other skin problems. It can be applied in much the same way as tea tree oil soak a cotton ball in the oil and then swab it on to the area that’s affected. You can also does a band-aid with eucalyptus oil (only on the soft, white part) and then apply that to your wart. That will ensure that the oil absorbs into the wart for a longer period of time. Eucalyptus oil can often be found in pharmacies or health food shops. Lavender essential oil is yet another powerful antibacterial and antiviral. It should not be consumed internally, but you can apply it in the same way as the other two oils listed here. Again, applying it to a band-aid can be a great way to ensure that you get it to absorb in your skin over a long period of time. Lavender oil can be found in many places, such as natural food stores and shops where they deal with aromatherapy, such as metaphysical shops. If you really want to do a number on your wart, one of the most effective ways that you can get rid of it is to use essential oils with duct tape. Any of the above oils will be great. To do this, simply soak a cotton ball with the essential oil and put it on to the wart. Then, apply enough duct tape to ensure that the cotton ball stays fastened to your skin. This will ensure that the oil stays to absorb into your skin, and the duct tape will further help to kill the wart. This method works great for very stubborn warts, like some of the plantar warts that appear on the soles of the feet. These warts are often resilient to other methods of treatment. Some people have had success using bee propolis to help treat warts. Bee propolis is a resin-like material that’s made by bees, and it has a number of health applications. You can apply the stuff directly to the wart and let it sit for awhile. Covering it up afterwards is a good idea because it will ensure that the maximum amount is absorbed into the skin. Bee propolis can be found in many natural and health food shops, and online. 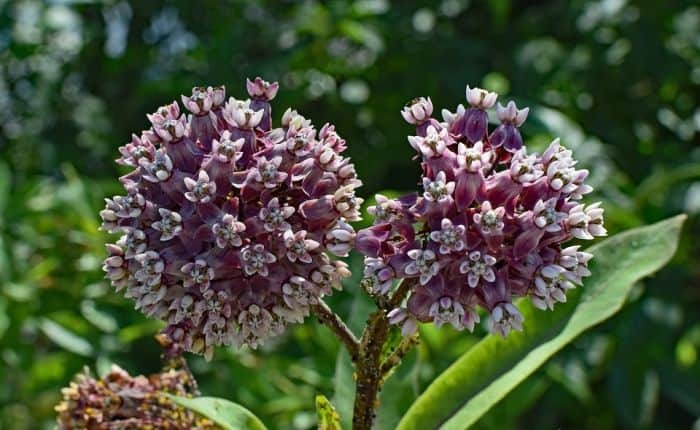 Milkweed is a perennial plant that has a number of interesting medical applications. It can be found growing on the side of roads or near pastures, and it has small pink flowers and green leaves. Some people find that it grows in their gardens whether or not they want it to. Milkweed shouldn’t be consumed because it can be poisonous in large amounts. However, it can be safely used topically for treating warts anywhere on your body. File down the wart before using milkweed. You can slice the weed and it will leak out a sap-like substance. This will look very similar to dandelion milk. Get enough of this sap to cover the wart or warts, and try to apply it several times a day for a couple weeks. If you develop a rash then you may be having an allergic reaction and should switch to a different treatment method. However, some discomfort might be expected as the milkweed will begin to dissolve the wart. Vitamin C tablets can be useful for helping to topically destroy warts. You can crush them up and mix them with water until you get a paste. You can mix them with lemon juice for an extra dose of vitamin C.
Apply this directly to your wart and then cover it with a band-aid or with duct tape to ensure that the wart can’t breathe. This will give you results quite quickly if you change the band-aid and apply the paste at least once a day. The acidity of the lemon juice will further enhance the speed of the treatment. Vitamin C also works internally by helping to enhance your immune function and can prevent you from developing warts in the future. You can get vitamin C tablets from any pharmacy and from most grocery stores. Basil is one of the best antiviral herbs around and it grows in many places. Fresh basil is best used for treating warts because you can crush up the leaves into a potent antiviral paste. This, you can apply directly to the wart. It’s best to cover it up afterwards with a bandage or some duct tape so the antiviral compounds absorb into the skin and target the wart. Dried basil can also be used, but you will have to use much more and boil it first or use alcohol to make an extraction of the antiviral compounds. An alcohol extraction will be best because it will help to kill the virus on its own. Dried basil can be found at most grocery stores in the spice aisle. Fresh basil can be found in some produce sections during its peak season. Honey is another common food that’s actually quite a powerful antiviral substance. Regular, processed honey is not as effective as raw honey. Manuka honey is the most powerful of the honeys that you will be able to find easily. Honey is easily applied to the skin because it’s so sticky. However, if you don’t cover it up with something afterwards, it will probably stick to whatever your foot first comes into contact with. For that reason you should use a band-aid or some duct tape afterwards. Manuka honey can be found in health food stores, as can raw honey. Regular, processed honey can be found at any grocery store. Mixing these two compounds together creates the amusing reaction that many of us first experienced during a grade school science project. This can also be a great reaction for helping to get rid of warts. Mixing baking soda and vinegar together into a paste and then applying it to the area of the wart can help you be rid of the virus quite quickly. Apply a bandage or duct tape afterwards and make sure that you apply several times a day. Warts are annoying, and they can be very persistent if you don’t treat them as soon as you notice them. Fortunately, there are a ton of home remedies that you can use to help rid yourself of these unsightly viruses before they spread too far. Make sure that you use a pumice stone or a file to rub the top layer of skin off of the wart before trying to get rid of it, otherwise you’ll just end up disinfecting the skin that’s already dead. Other than that, good luck treating your wart and hopefully this information helped! The advice in this article is for information purposes only, and is not to be considered medical advice. Before employing any of the advice in this article, please consult your physician. Neither the author nor www.homesteadinghippy.com shall be held liable for any damage, injury, death or any side effects as a direct or indirect advice of applying the advice given in this article. Nigel enjoys sharing wisdom regarding nutrition and health when he's not playing music, loving nature, and being at one with the world.